If you live or have visited Pattaya before you would have definitely seen people on wheelchairs roaming around the city or in malls and hospitals. The numbers of wheelchair users are increasing drastically in Pattaya City. But have you ever wondered or questioned how these users travel? I had an ordinary life until 2 January 2010, when I became a victim in a terrible car accident in which I sustained a severe Spinal Cord Injury (SCI) which left me paralyzed from the neck down. Since then it’s been a challenging 4 years and I’ve been completely dependent on a wheelchair. I never realized the challenges and the impact of being on a wheelchair, until it became my only means of mobility. Yes, it looks like an easy task, but each time a wheelchair user needs to get to a new location, the hassle starts. Statistics of people with disability – From 24 September 1994 to 31 March 2014. 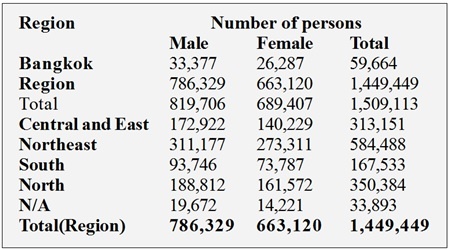 Source: Information as of 1 April 2014, Disabilities All: 1,744,831 persons; Disabilities alive: 1,509,113 persons; Disabilities dead: 235,718 persons. Living in a city and trying to accomplish a normal and independent lifestyle for wheelchair users like me is still a major question and concern. Being dependent on others limits our opportunities. Maybe it’s time for Pattaya to follow the world’s major cities and create a wheelchair inclusion society where the able-bodied and the disabled can share the same platforms. Before all I must express my gratitude to Pattaya City for the special lane for Persons with disability (PWD) that was constructed in front of the Father Ray foundation. This special lane project is a step towards creating Pattaya as a wheelchair friendly city. Pattaya, being the country’s most happening city, has portrayed itself as the real estate hub. It also has attracted a large number of tourists and it serves as a perfect retirement destination due to its weather, cost of living and friendly people. The AEC promises new levels of opportunity, therefore the infrastructure that best serves all will provide Pattaya with more advantages and opportunities. Pattaya, also known for the ‘Pramahathai School for the Disabled’, is a platform for the disabled to seek knowledge and secure jobs to support themselves. In short, the city has attracted and positively impacted the disable tourist sectors and locals. The objective of this letter is to explain the significance and the need for an accessible public transportation for wheelchair users; i.e., wheelchair taxi/vans or even customized wheelchair accessible ‘songthaews’, wheelchair ramps, signage’s and accessible roads or lanes, that best fit the city’s infrastructure. PWD and the elderly population are mainly not exposed to the outside world. Moreover, the major expenses we have to deal with, i.e., daily activities, caregiver fees and transportation fees, are crippling our family’s finances. Getting around in a wheelchair is a huge challenge as we all know, especially in a country like Thailand where ramps and wheelchair accessible taxis are not available. I and many like me have to depend on others to take us out, which means we have to follow others’ schedules. Many PWD are stuck at home because they have no transportation modes that can drop them to their destination. Apart from these issues people on a wheelchair are also faced with issues like ignorance and negligence. Bangkok, the capital of Thailand is one of the most popular tourist destinations and has no doubt attracted large businesses, investors and tourists from all around the globe. The quality of life now known as ‘The Empowerment Act’ of citizens has become governments’ top priority in improving the welfare of most countries. Bangkok itself has invested in wheelchair accessible taxis to give the minority group a chance to fit in this society, but due to political reasons all projects funded by the government have taken a plunge. In Thailand, people with disabilities receive only 500 baht per month as a disability allowance and are also covered under the universal coverage under the ‘Persons with Disabilities Empowerment Act B.E. 2550 (2007’). These wheelchair accessible taxis will provide PWD and the elderly population with the independence to travel and reach areas that would not be possible otherwise. Being able to have the freedom to travel or just reaching a particular destination is by far a dream of every wheelchair user. Moreover, the inclusion of PWD in the society will educate people about the challenges and could create awareness to the society. Most famous cities around the world have seen the importance of wheelchair accessible taxis and other public services, i.e., public toilets, ATM booths, etc, which have been customized to serve PWD and the elderly sectors. It’s hopefully now time for Pattaya to see and understand the positive impacts it can have for the elderly and the wheelchair user population, most importantly to the image and status of the city. Yes, the disability group is seen as a minority group but with those staggering numbers we sure know that there are many out there that need help. The number of wheelchair users are increasing, ranging from all ages, both local and tourists. Let’s join hands in turning Pattaya into a wheelchair friendly city by providing wheelchair taxis, wheelchair signage, and ramp services so that people with disabilities and the elderly group have a chance to have a better quality of life. Transportation and accessible ramps are all it takes for wheelchair users to reach their destination and to experience freedom. The number of obstacles PWD have to meet to fit in the society is still kept a silent tale. Therefore, let’s make this happen.